Vryhof, the market’s trusted global provider of customer-focused anchoring and mooring solutions, underlines the importance of a partnership in fulfilling future mooring requirements. Managing Director Leopoldo Bello has laid out his vision on the advantages of a project partnership with major EPCI contractors, based on his belief that greater collaboration will define the future of many main contractor and sub-contractor relationships in the offshore industry. In real terms, Vryhof has already been delivering permanent mooring systems to the oil & gas sector since the early nineteen seventies, and more recently total mooring solutions to the renewables industry. In both market segments, Vryhof has successfully completed numerous challenging assignments, and has demonstrated its capability to moor any type of floater. In August last year, Vryhof contributed to the complete mooring system for the Kincardine Floating Wind Farm located around 15 kilometres to the southeast of Aberdeen in Scotland. In early 2019, a further agreement was signed to supply three full scope mooring systems to the WindFloat Atlantic wind farm off the coast of Portugal, the world’s first commercial floating wind farm. At the same time, Vryhof’s three businesses – Deep Sea Mooring, Vryhof Anchors and MoorLink – have announced the awarding of a series of landmark deals from the international oil & gas sector, too. One sector that is revitalising its importance on the market for offshore floating terminals is the utility sector. Floating storage and regasification units (FSRUs) have proliferated since 2015, with many countries intending to switch to a cleaner and increasingly cheaper fuel than oil and coal. Power plants are under construction everywhere, in the Mediterranean, South East Asia, Australia, India, the Middle East and West Africa. In certain instances, however, onshore power plants are planned to be built fairly close to the sea. In these cases, the process of LNG redemption can be carried out offshore, on board a permanently moored floating storage and regasification unit. LNG receiving terminals that use FSRUs can be installed at a lower cost and fabricated within a shorter period than conventional onshore receiving terminals and are viewed as an effective means of building LNG receiving capacity in emerging countries. They represent huge advantages over an onshore import terminal. The remaining challenge for the electricity company is: how do we set up a mooring arrangement for the FSRU? Engineering companies with knowledge of civil engineering work on land can propose an expensive existing mooring system; on the other hand, the FSRU owner can opt to enter into a project partnership with a mooring system supplier such as Vryhof, for the delivery and certification of a customised anchoring and mooring solution. The Republic of Malta, located in the Mediterranean Sea, has traditionally been reliant on diesel and heavy fuel oil for its power generation; these facilities no longer satisfy present-day European environmental legislation and provide power in an inefficient and expensive manner. To address the environmental requirements and to create a more efficient and better-value power supply, a liquid-natural-gas-to-power project was developed by ElectroGas Malta Consortium (EGM) as a significant contribution to Malta’s future energy strategy. Within this project, Vryhof worked in partnership with the Norwegian subsea contractor Ocean Installer. The installation of the eight STEVPRIS® anchors proposed by Vryhof had to be undertaken in a bay area with water depths ranging from 14 to 17 metres, but with heavy marine traffic. The permitted work area was so narrow that the only way to tackle the problem was to employ Vryhof Anchors’ STEVTENSIONER®. No other installation method is as well suited to such a shallow bay location, since its design involves a vertical pull to induce more than twice the horizontal pull. Furthermore, the work area taken up by the construction support vessel Normand Pioneer was cut by as much as 75%; a decisive benefit in this particular situation. Vryhof in fact completed its first FSRU mooring project in 2011, near the port of Livorno on the western coast of Tuscany, Italy. Although Malta and Livorno are both located in the Mediterranean Sea, the two projects differ considerably. The Livorno project involved a floating regasification unit that had to be moored 12 miles off the coast of Livorno, in a water depth of 120 metres, and connected to shore by a 29 km-long buried export pipeline for transferring the gas to the national distribution system. 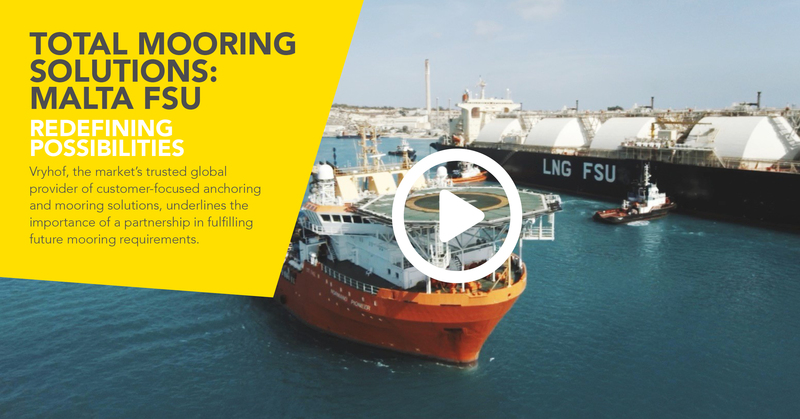 The Livorno FSRU has a storage capacity of 137,000 cubic meters of LNG and a production capacity of 3.75 billion cubic meters of natural gas per year. All in all, the installation of the anchors in the soft clay seabed soil including the tensioning operations took just 6 days. In August 2018, Excelerate Energy Bangladesh completed the commissioning of its Moheshkhali Floating LNG (MLNG) terminal, the first LNG import facility in Bangladesh. The new terminal will enable Petrobangla, the state-owned Bangladesh Oil, Gas & Mineral Corporation, to procure enough LNG to increase natural supply to the country by 20 percent. Vryhof successfully supplied the hold back anchors essential for the operation in a situation where demanding sea conditions and monsoon weather patterns can present unique challenges. Shortly afterwards, Petrobangla developed a similar FSRU project to support the nation’s goal of achieving 17 MTPA of gas imports, by 2030. Summit LNG Terminal is currently developing an LNG receiving terminal that will also make use of an FSRU. Construction work on the terminal, located only six kilometres off Moheshkali Island, was started at the end of 2017, and commercial operations are expected to begin in Q3 2019. Vryhof has supplied similar hold back anchors for this second FSRU.